GN Solids Control oil sludge treatment system is mainly used to recover valuable oil in the sludge, and the sludge treatment process can generate greater economic benefits. At the same time, the emission of harmful substances has been greatly reduced. 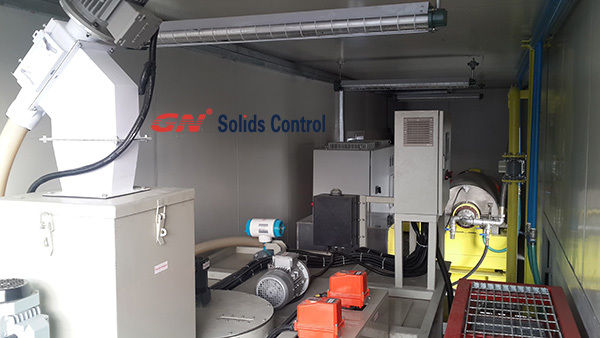 Recently, GN Solid Control completed the manufacture of a full set sludge treatment system. The system is currently undergoing final assembly and factory testing and will be shipped to a waste management customer in Asia. The working principle of the sludge treatment system is oil, water and solids three-phase separation. Therefore, GN Solids Control sludge treatment system is mainly composed of three parts: coarse particle separation unit, fine particle separation unit and oil-water separation unit. The coarse shaker screen is used to remove large particulate solids from the sludge. Before feeding the shale shaker, the operator needs to dilute the sludge with solids content less than 20% for pump transfer. GN Solids Control oily sludge treatment system has a sludge vacuum pump, which is ideal for sludge transport. The shale shaker is located on a canister that collects liquid through the vibrating screen. A mud agitator is installed in the tank to prevent solid precipitation. A decanter centrifuge is used for fine particle separation. GN Solid Control is capable of providing 9 to 30 inch decanter centrifuges. The feed pump draws sludge from the tank under the shaker screen and feeds it to the centrifuge. During the separation process, the fine solids are removed, and the oil-water mixture is discharged to further separate the three phases. GN Solid Control uses a disc centrifuge for oil, water and very little solids separation. Disc centrifuges can operate at higher speeds, allowing oil and water to be separated. Depending on the customer’s working conditions and use, a chemical dosing device is required to help remove oil from the solids. According to different material handling requirements, GN Solid Control has designed three types of sludge treatment systems: GNOST-01A, GNOST-05A and GNOST-15A. For more information on sludge handling systems, please feel free to contact GN Solids Control. IE expo 2019 Environmental protection exhibition is organized by the Munich Expo Group of Germany, the Chinese Society of Environmental Sciences, China Environmental Service Industry Chamber of Commerce, China International Munich Exhibition (Shanghai) Co., Ltd., as an exhibitor and audience gathering of environmental protection equipment exhibition, involving water exhibition area, solid Waste exhibition area, atmospheric exhibition area, soil and groundwater remediation exhibition area, and several other major exhibition areas. China’s major environmental protection engineering companies, environmental service companies, petrochemical companies, biopharmaceutical companies participated in the IE expo 2019 environmental protection exhibition. During the exhibition, the enviroment protection industry’s cutting-edge equipment and technology will be unveiled at this exhibition. 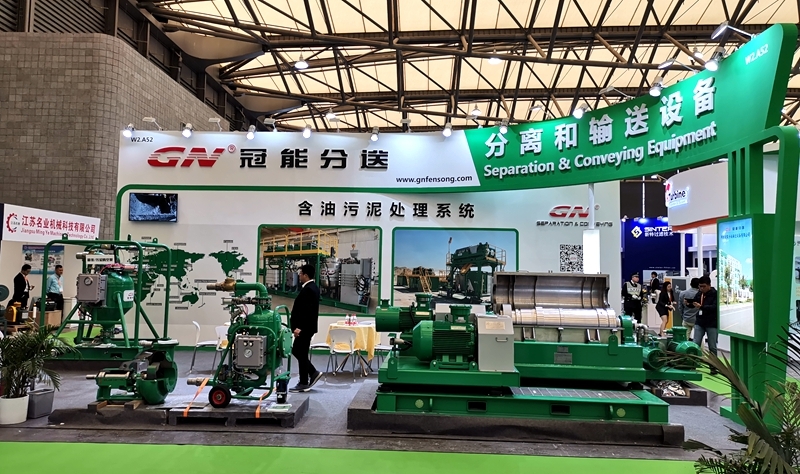 Of course, GN Solids Control exhibited the company’s featured products such as decanter centrifuge, sludge vacuum pump and centrifugal pump. Among them, the horizontal decanter centrifuge exhibited two models, GMLW224D mini size 9 inch, and GMLW363D the popular size 14 inch centrifuge. And the sludge vacuum pump exhibited two models, GNSP40B big model and GNSP20B middle model size. The GMLW224D centrifuge has a bowl speed of 4,500 RPM and max. G force 2,492 G, It is one the world’s smallest industrial application centrifuges. The compact design allows this type of centrifuge to be widely used for solid-liquid separation requiring small throughput or limited field conditions, and is also ideal for experimental testing of centrifuges. The maximum processing of the centrifuge is approximately 130 L/min. 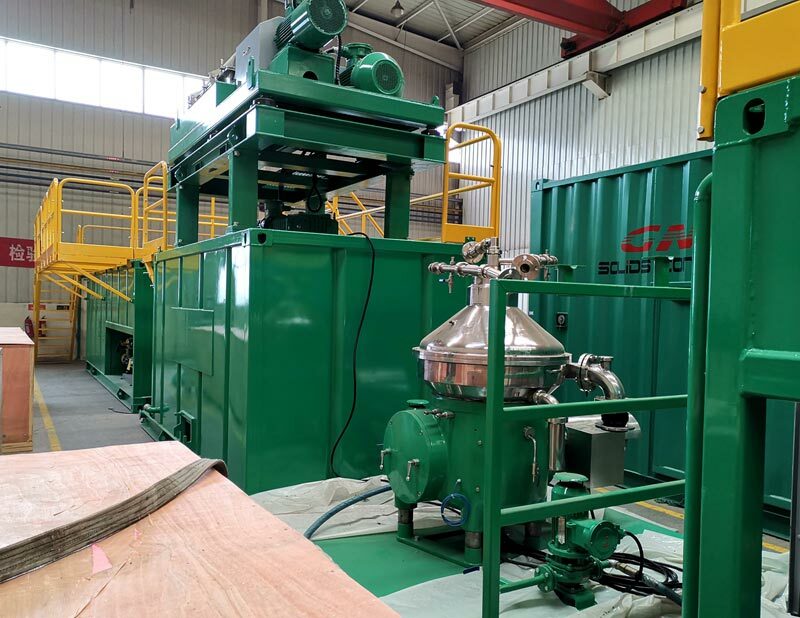 GN Solids Control Centrifuge is widely used in drilling mud treatment, sewage environmental protection treatment, oil sludge treatment, chemical and food and beverage industry solid-liquid separation. For more information about GN Solids Control or GN Separation, please contact their sales managers through the website. GN Solids Control is a leading brand from China for drilling mud solids control equipment, drilling waste management equipment, industry waste management and high quality replacement shaker screens. GN Solids Control major products are pit-less and zero-discharge system with drilling mud solids control and drilling cuttings management equipment, oily sludge separation unit for sludge from different sources, including but not limited to tanks bottom, oil pits, API separators, drilling rig mud system, refinery, tank cleaning, etc. 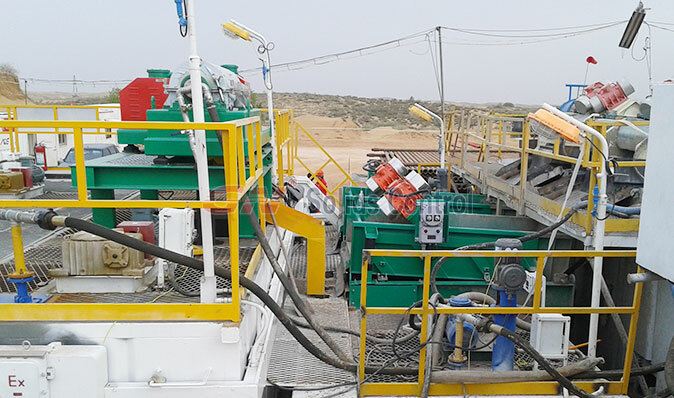 Many customers who would like to seek some proposals to help them to better manage their drilling cuttings and drilling mud generated from their drilling activity. Recently, a drilling company contacted GN Solids Control. Their activity is mainly at onshore in a highly populated community area in a Middle East region. Currently their method is to disposed both the drilling cuttings and drilling mud inside waste pits nearby the drilling rig sites. However, the high water table of the groundwater level and current raining season is not helping and is not sustainable to maintain. Therefore they are seeking for other ideas on how they can better manage the cuttings and mud. If possible, they want something that can help them to expedite the evaporation rate of drilling mud and drilling cuttings. GN Solids Control recommends their pit-less system. GN shared some layouts for their reference, and helps the client to find out the best solution. The helical bevel mud agitator adapts Gleason quasi-hyperbolic gear reducer. The helical bevel gear reducer is equipped with hard tooth surface. It is large loading capacity, low noise, long service life and high efficiency. There is another kind of gearbox for agitators: it is worn and gear agitator. Compared with worn and gear reducer mud agitator, the helical bevel reducer agitator is more heavy duty and reliable, its torque is nearly double than the worn and gear agitator, so the helical bevel agitator can adapts a stronger performance with a smaller motor to reduce power. But the cost of helical bevel agitator is much higher than the worm and gear reducer agitator. So when you compare mud agitator quotation from different suppliers, please specially payment attention of the technical description on the reducer types. GN Solids Control can offer both helical bevel mud agitator and worn and gearbox mud agitator with different motor powers. Clients can choose the suitable type per his mud condition and the budget of the project. Or clients can contact GN sales manager to recommend you the suitable type for his project. 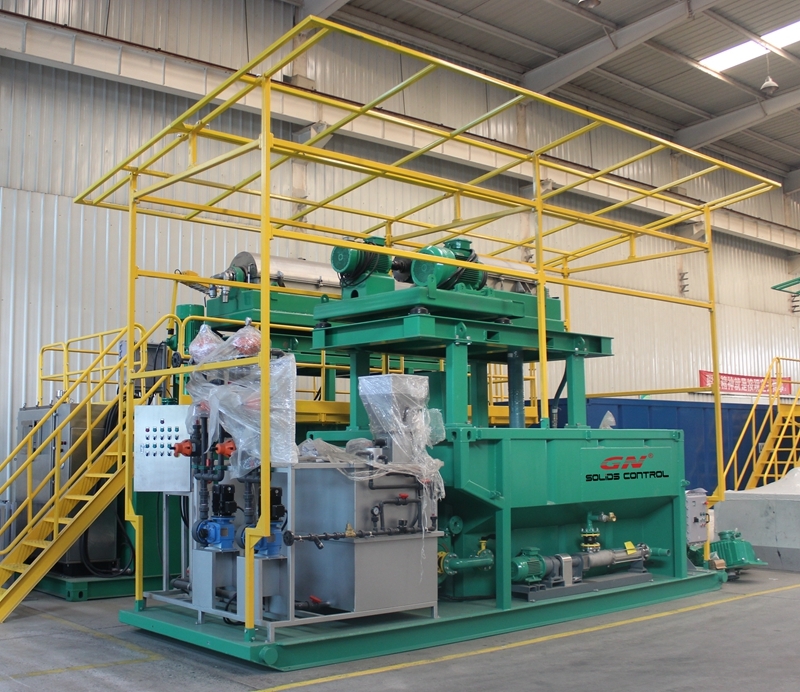 Besides mud agitators, GN Solids Control does also offers other processing equipment for drilling mud processing and recycling, like shale shaker, mud cleaner, decanter centrifuge, dewatering centrifuge, mud gas separator, vacuum degasser, mud tanks, … GN Solids Control does also make high quality replacement shaker screens for his own design shakers and also for other famous brand and popular models shale shakers, like for Derrick shale shakers, Swaco shale shaker, FSI shale shakers, Brandt Cobra shale shaker, etc… For other brand replacement shaker screen information, welcome you contact GN team to double check. Glad to say that, the biggest event, the 2019 CIPPE oil show is coming in March in Beijing. Most of the oil field relative company from word wide will take part in the oil show. And the same as usual, the leading manufacturer- GN Solids Control will also join the big even with his latest design equipment, to share with his clients and peers. 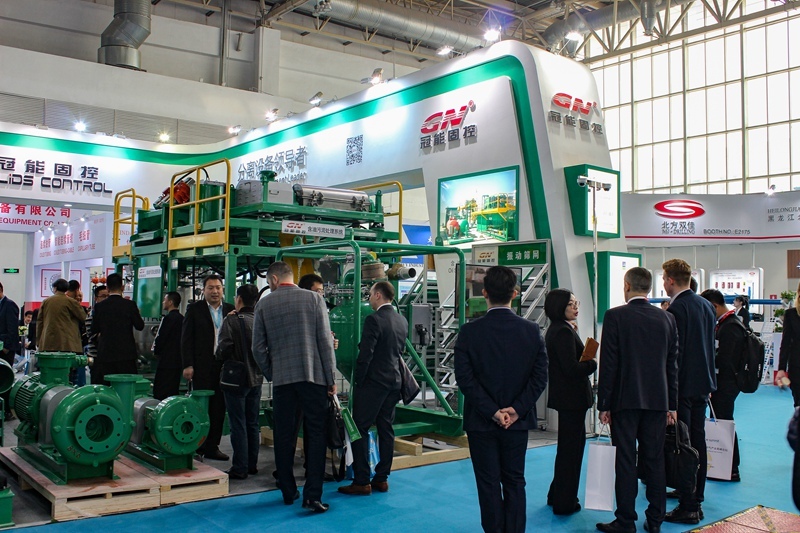 You can source nearly all oil field involved equipment in Beijing CIPPE oil show, like big and small drilling rigs, drilling pipes, hoses, tubes, fittings, pumps, solids control equipment, drilling waste management products, replacement shaker screens, explosion proof equipment, drilling mud chemicals, etc… No matter you are manufacturers, supplier or buyers, the 2019 Beijing CIPPE oil show will be a good chance for you. For more information of 2019 CIPPE Beijing oil show, you can visit their website: http://en.cippe.com.cn/. 1) The most popular equipment: shale shaker and mud cleaner for drilling mud system. Although shale shaker and mud cleaner is the most common equipment but also it is important. GN Solids Control made many patent design particularly to improve user friendly. 2) Decanter centrifuge with latest design for different applications. GN Solids Control makes different sizes centrifuges from smallest size: 9 inch decanter, to the most popular size 14 inch centrifuge, and big bowl centrifuge 18 inch, 22 inch and the largest size 30 inch. specially designed for drilling waste and industry waste management treatment. 3) High quality composite material replacement shaker screens for all GN shale shakers and for all popular brand shale shakers. GN Solids Control can also customize shaker screens per clients request. 5) Oily sludge treatment system, including dewatering system. Welcome clients come and visit GN on 2019 CIPPE Oil Show in Beijing. GN Solids Control is a leading manufacturing to design and make drilling waste management system especially for drilling field. It includes oil and gas drilling waste mud and disposed cuttings treatment, horizontal directional drilling waste mud treatment, CBM drilling mud and waste treatment, construction, piling and micro tunneling waste water and waste mud treatment. Recently, a client contact from oil and gas drilling was searching for a water base mud treatment plant to add to their 1500hp drilling rigs. They contacted GN Solids Control sales manager, and asked: Can we still get lab analysis of the disposed water. That will help us in sourcing the water treatment plant coupled to the WBM treatment plant. But waste water treatment and analysis is a complex process. The client would need to be more specific on what it is exactly they want to analysis for the disposed waste water recovered from the WBM plant and dewatering system. There are something 36 separate tests in lab analysis for water prior to disposal, depending on the scenario. But mostly clients are not drilling company or mud services company they did not do WBM treatment before. They want to add they system to their rigs, and want something for reference or to show to their management or clients. They know what they exactly want. GN Solids Control attached 2 projects information for reference to the client. One project is the upfront Lab Tests a client did for a project in Asia, this was to ascertain the best polymers to use for the project. Another reference attached is a lab result for the recovered (after dewatering unit) water, this was performed by the client from the same dewatering project they did offshore in an Asia country. All recovered water was disposed overboard in a busy fishing area for boats. There are photos to show the mud before treatment and recovered water from dewatering unit. GN Solids Control is not only an equipment manufacturer to make full line solids control equipment, Drilling waste management equipment. GN Solids Control is also a leading brand to make high quality replacement shale shaker screens and explosion proof electrical control systems. In this case, GN Solids Control knows more about the clients’ request about the control system, and can improve promptly per jobsite feedback. For example, for the electrical motor starter panel for screw conveyors, most other companies only have E-stop for protection. GN Solids Control can equip an Audio / visual alarm system connecting to auger starter. There will be safety delay time inside the auger motor starter. After the auger starter is switched on, the panel will give Audio / Visual alarming to the jobsite operators nearby in the OFF MODE after some time the auger panel start operation. All electrical equipment and / or electrical accessories equipped for the screw conveyor auger system are explosion proof with high water & dust protection level, which are designed and certified for Hazardous areas for all oil and gas drilling field with suitable ground protection. Furthermore, GN Solids Control can equipment limited switches or grab wire along the auger cover for automatic switch off in case any auger top cover is opened or loose from the closed situation. 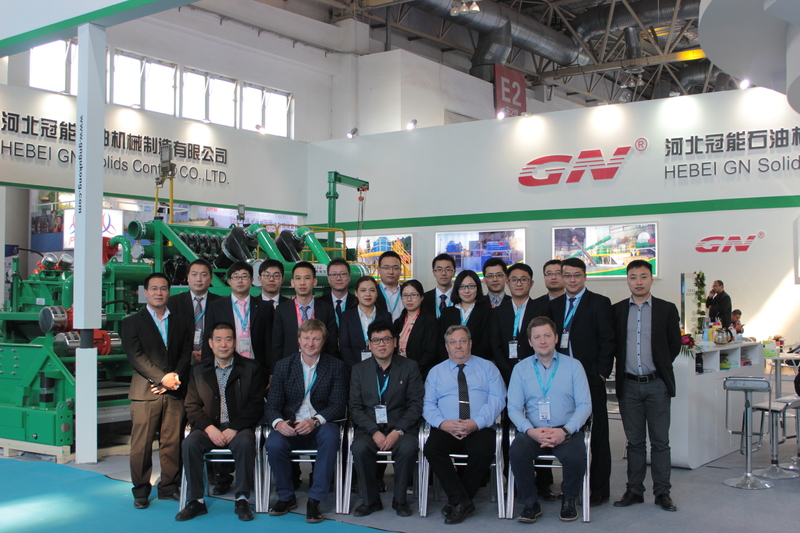 For any questions about the screw conveyor auger system, or its control system, or for any questions on drilling mud solids control, drilling waste management, welcome you contact GN Solids Control sales teams. 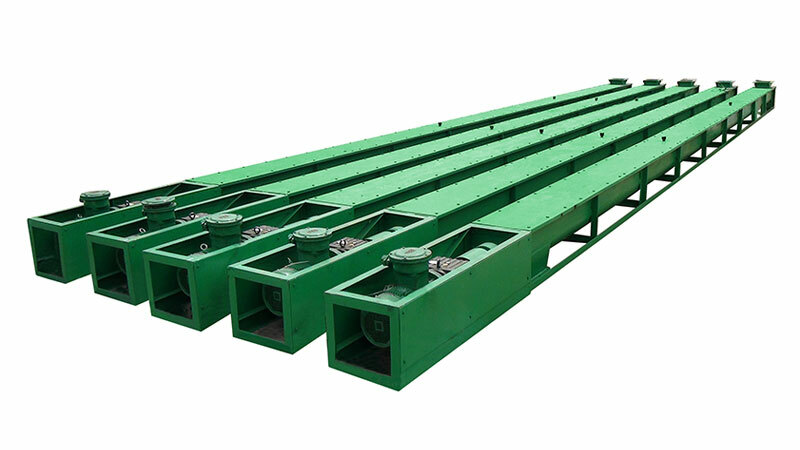 The screw conveyor auger system is widely used in oil and gas drilling field. As it is flexible for application and easy for layout. The screw conveyor auger system can move wet or dry cuttings. The screw conveyors can be put under the shale shaker, desander, desiler and decanter centrifuge. The augers can also be put inclined to transfer the drill cuttings from the horizontal screw conveyor or from other equipment, and feeding to the cuttings treatment equipment, like oil base mud vertical cuttings dryer, or water base mud high G shale shaker dryer. Unlike other screw conveyor suppliers, GN Solids Control is specialized in oil and gas drilling applications, GN knows well the safety and HSE request of the screw conveyor auger systems for safety operation. Below are some of the available designs for oil field safety application. Clients can contact GN Solids Control sales team to check what applications they need before they order. GN Solids Control screw conveyor auger system Design 1: All GN standard screw conveyor auger system are composed by 12ft standard auger for each section. Users can use 1 section for 12ft, 2 sections for 24ft, 3 sections for 36ft and max. 4 sections for 48ft. For other length, please contact GN sales team for double check. GN Solids Control screw conveyor auger system Design 2: All auger top is covered by metal plates or gratings to avoid fingers involved in. The top cover plate can be equipped with bolts at 2 sides on the top of the auger for fixing the plates / gratings. GN Solids Control can also equip hinges on one side, and fix locks / bolts on the other side. For this kind of design, the jobsite operators can open the top cover by not removing the top cover away. GN Solids Control screw conveyor auger system Design 3: There will be emergency top switch on the auger control panels, It can located at the shale shake areas and nearby the augers. GN Solids Control screw conveyor auger system Design 4: Audio / visual alarm connecting to auger starter. Hebei GN Separation and Conveying Equipment Co.,Ltd is a branch company of GN Solids Control. GN Solids Control is well known for solids control and waste management industry. The main application of GN Solids Control products are for oil gas drilling mud, HDD, drilling waste management, and oil sludge treatment. 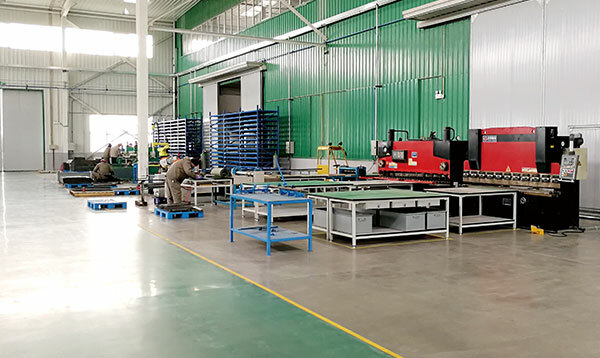 But Hebei GN Separation and Conveying Equipment Co.,Ltd are positioned for industry separation and conveying solutions. GN Separation and Conveying Equipment main products include industry decanter centrifuges, screw conveyers, centrifugal pumps, solids vacuum pumps, oil water separation, inclined plate clarifier, and screen scroll centrifuge. All the products are made for material separation and conveying. Part 2: GN Separation and Conveying Equipment Main Application industry. GN Separation and Conveying Equipment are popular for use in waste water treatment, chemical and pharmacy industry, Food industry, Mining industry, and construction engineering industry. For those industries, clients have different requirements for the material separation, and transfer the material to the desired position. GN different design of decanter centrifuges and separators are widely used for different material treatment. The GN Solids vacuum pump is a special pump widely used for mining industry slurry transfer. GN screw conveyors are available in different sizes for a widely material transfer. GN Screen scroll centrifuge are widely used for the coal industry to dry the coal. Moreover, the inclined plate clarifier and oil water separators are popular used for the water treatment industry. 1) We produce over 200+ sets of different size of decanter centrifuges. 2) GN separation produces over 1000+ centrifugal pumps a year. 3) GN separation produces over 1000+ screw conveyors a year. 4) GN separation produces over 500+ solids vacuum pumps a year. GN Solids Control is reputable manufacturing focusing on high quality replacement shaker screens for different shale shakers. GN Solids Control makes high quality composite materials replacement shaker screen for most of the popular shale shaker and mud cleaner models. GN Solids Control is the first API Certified company for manufacturing shale shaker screens and solids control equipment from China, with location in USA and Russia. Below are some of the shale shaker models made and offered by GN Solids Control. G59E high quality pretension composite material shale shaker screens. It is the most hot sale shale shaker screen models from GN Solids Control. The screen can suits for GNZS594 series shale shaker, mud cleaner and high G drying shakers. It is also Compatible with MI-Swaco MONGOOSE PRO, MONGOOSE PT & MEERKAT shale shaker or mud cleaner. B635 composite material pretension screens. The screen can be compatible with NOV Brandt Cobra, King Cobra, Mini Cobra, Venom, LCM-2D, LCM-3D shale shaker or mud cleaner or mud conditioner. The Brandt OEM screen is traditional metal frame. While GN Solids Control can make high quality replacement screens by composite material. Compared with metal frame screens, the composite material screens are with bigger usable area and better conductance. For the same API size, the composite screens can process more drilling fluids. BVS1 and BVS2 composite material screens for Brandt VSM300 shale shakers. D50D, D50P, D20P, D20P, D600 and DHYP series screens for Derrick shale shakers or mud cleaners. Per clients’ jobsite comparison test, many of GN Solids Control replacement screen quality is similar or even better than the OEM screens. Unlike other screen manufactures, GN Solids Control is also a leading manufacture on shale shakers. GN Solids Control knows more about the shale shaker design and performance. And they know more about the request and demands of jobsite on the replacement shaker screens. And as GN Solids Control is also a major manufacture on full line solids control and waste management equipment, GN can share the facilities for equipment processing and for screen manufacturing. GN is capable to invest more on the new technology and improvement of shaker screens.